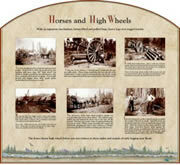 Our graphic layout and design for one of several historical interpretive signs for Bend Parks and Recreation. Customized graphic design service for brochures, pamphlets, logos, and signs. Allow Art Resource Technology to create an exciting graphic layout to optimize your advertising message or publication material.Give us your ideas and we'll be creative--send us your documents and we'll prepare a draft for you to proof. After you have proofed your document, send it back to us for final preparation. We offer scanning, digital photography, and color laser printing to enhance your documents. All documents remain confidential and are archived for future revisions or for specific presentation.